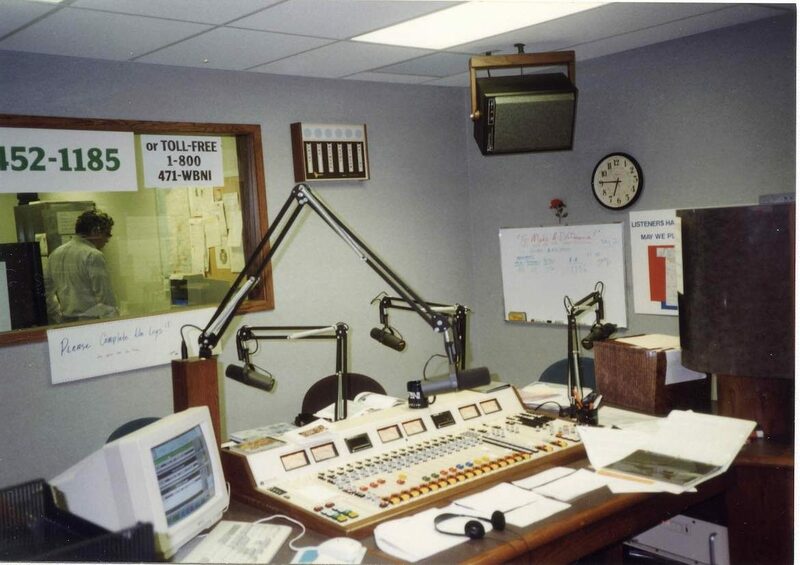 The studio of WBNI in Fort Wayne, Ind., in 2007. FCC commissioners voted 3-2 Tuesday to eliminate rules requiring radio and TV stations to maintain and staff studios in or near their communities of license. The main studio rule, on the books since 1939, was originally intended to ensure public access to local broadcast stations. The rules included requirements that stations employ full-time staff and maintain local facilities that can originate programming. But at a public meeting Tuesday, the FCC’s three Republican members, over dissent from the agency’s two Democrat commissioners, voted to end the regulations, contending that the requirements were obsolete. “The Commission recognizes that today the public can access information via broadcasters’ online public file, and stations and community members can interact directly through alternative means such as e-mail, social media, and the telephone,” the FCC said in a release. “The record … demonstrates that eliminating this rule will enable broadcasters to focus more resources on local programming and news gathering and community outreach, equipment upgrades and attracting new talent, all of which will better serve their communities,” said FCC Chairman Ajit Pai, a Republican, in a statement during the agency’s meeting. But FCC Commissioner Mignon Clyburn, a Democrat, said that by voting to eliminate the rules for all stations, regardless of size, location and financial circumstances, the FCC had signaled that it no longer believes broadcasters need to have a local presence in their communities. “Instead of taking a sledgehammer to the main studio rule, the FCC majority could have exacted a more measured approach, such as a revised waiver process, that considers market size and economic hardship,” Clyburn said. In comments filed at the FCC in response to the agency’s proposal to eliminate the rules, NPR said the regulations placed unnecessary burdens on public radio stations and should be eliminated — at least for public radio stations. Public stations, according to NPR, would remain “inherently local program services and community institutions” without the rules, in part because their ownership is limited to governmental entities and nonprofit educational entities and because they rely on local funding. In addition, NPR pointed out that nonprofit educational licensees must have community advisory boards to qualify for CPB funding and that public radio stations must hold public board meetings to qualify for federal funding. “At least with respect to public radio, therefore, eliminating the main studio rules would have no adverse effect on a broadcasting system founded on the principle of localism,” NPR said in its FCC filing. Also filing comments supporting elimination of the rules was New Hampshire Public Radio Inc., licensee of eight public radio stations in the state. In its comments, NHPR said it relies on rule waivers to provide “high quality news and educational programming” throughout the state using the main studio of its flagship WEVO in Concord. “Simply put, NHPR would not have had the resources to expand its network of stations if a main studio had been required for each station,” NHPR said in its FCC comments. America’s Public Television Stations, the advocacy organization for public TV, said it was “grateful” for the FCC’s decision. “We are encouraged by Chairman Pai’s leadership in undertaking a thorough review of outdated and unnecessary burdensome rules on our public television stations that only distract from their valuable public services to their local communities,” said APTS EVP Lonna Thompson in a release. Commercial broadcasters also supported the elimination of the rules. “We’re confident that cost savings realized from ending the main studio rule will be reinvested by broadcasters in better programming and modernized equipment to better serve our communities,” said Dennis Wharton, a spokesman for the National Association of Broadcasters, in a statement Tuesday. But some FCC commenters opposed elimination of the rules, including the advocacy group Free Press. “Communities need the main studio rule to help preserve broadcast media’s local roots and to hold local stations accountable when they fail to serve the public interest,” Free Press said in FCC comments. Eliminating the main studio rule could hurt radio by undermining the medium’s traditional emphasis on local roots, said Nathan Moore, GM of University of Virginia–owned WTJU-FM in Charlottesville, Va., in an interview before the FCC vote. Also supporting the previous regulations was David Crider, an adjunct professor at State University of New York at Oswego and faculty adviser for student-run college station WNYO-FM. THREAD: Main Studio Rule going down on a party-line vote is not surprising. Pai made it clear on Day 1 that he would cut "unnecessary" regs. Crider said in an email to Current that he’s concerned eliminating the rule will reduce the number of radio facilities where students can work. The FCC will continue to require broadcasters to maintain local or toll-free telephone numbers “to ensure consumers have ready access to their local stations,” according to the commission’s news release. Allow me to begin by saying: this doesn’t really impact public radio much (since it’s always been trivially easy for non-comm pubradio stations to get exemptions to the Main Studio Rule/MSR). I personally believe it will allow commercial radio to make itself into an even more inferior product in its never-ending quest to cut costs, and thus public radio looks better by comparison…although we are at, if not past, the point where commercial radio is making ALL radio look bad in the eyes of the consumer, and public radio is not doing anywhere near enough on the marketing side to counter that perception. Okay, with that out of the way: I see a lot of emotional response to this, I don’t see a lot of data. For example, I see this as a very simple calculation. Take iHeartRadio for example. Take how much it costs to maintain a studio/office presence in medium-sized market A, and what they’d save by shutting it down. That cost is number X. Now take how much money they’d lose in ad sales by offering an inferior product if they closed up shop and ran everything from major-sized market B 100 miles away. That cost is number Y. If X > Y, then iHeart will do it. It’s really that simple; everyone (with two exceptions) in medium-sized market A will be laid off or relocated to large-sized market B’s facility. The two exceptions are the major talent and the salespeople. At a lot of medium-sized markets have SOME “big talent” that’s worth keeping around. Some will have the clout (or contract) or necessity of staying in their market, so they’ll operate out of home studios…which have never been easier to do. The rest will be forced to move and pretend they’re still local (something commercial radio has done for decades now) or will just be laid off to cut costs. The salespeople I’m less sure about. In theory they can do all their work via the phone, email and Skype. In reality it’s probably not that simple. But OTOH, salespeople – probably more than anyone else – can work out of their homes since they’re on the road so much. I’m not sure they need a central office/studio that’s in-market. Maybe it won’t happen right away; undoubtedly there are leases involved on some of these properties, and that skews the X > Y equation above. But within a few years? I would not be surprised at all to see Cumulus, Entercom, iHeart and the other big players all have 10 to 12 “regional superhubs” that cover all their signals over a 200-500mi radius. And yes, this will undoubtedly make it more difficult for entry-level workers to find jobs. But OTOH, hasn’t that particular path been almost entirely closed for several years now? It’s damn near impossible to find a job in radio at anything approaching a living wage even if you’ve got 10 years of experience, never mind if you’re fresh out of college. Awesome analysis Brad D. ??? ?